We got a coupon in the mail for a FREE sour cherry Slurpee® and as much as my kids want to go and use it, I keep strategically forgetting. I was shocked to learn that one 355 ml serving of this Slurpee has 46 grams of sugar, almost 12 teaspoons. I’m also not crazy about the ingredient list: glucose/fructose and/or sugar, water, citric acid, natural and artificial flavour, colour, sodium benzoate, and acadian gum. So the question is – do we want a free Slurpee? Maybe I can come up with a suitable substitute. Something refreshing, tangy, cold, with less sugar and lots of ice, that freezes your brain. Ok, maybe not that last part, but you know what I mean, something that would substitute for that summer ritual, the Slurpee. That coupon inspired me to experiment! As much as I would like to not ever use that coupon, I believe that my kids need to make the choice. They are getting older and more independent and will soon be making many more of their own choices. If I restrict things, it makes them want it more. I want and hope to provide them with education and curiosity about the choices they make, to wonder how things are made and with what ingredients. Yes, I want them to be concerned about nutrition and make healthy choices most of the time, but also to find a balance that works for them, and if they really want to occasionally try something like a Slurpee, that is ok too. 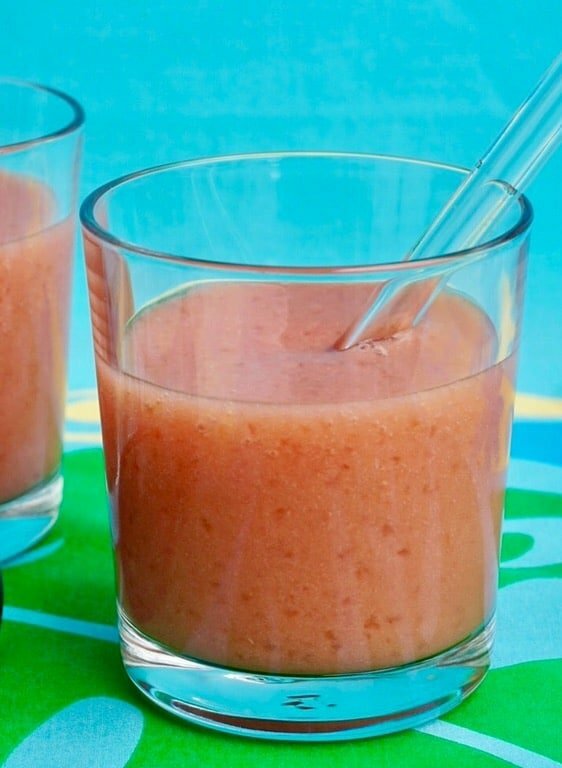 Refreshing and cool, this tangy, tart Rhubarb Orange Slushie is a great hot weather beverage that both adults and kids will line up for. Rhubarb and orange flavours are very complimentary and the honey adds just enough sweetness. To preserve some of the pucker from the rhubard, which I enjoy, I used only a little honey but adjust it based on your taste. These are so easy to make and there is no end to experimenting with different fruit combinations. Homemade slushies are delicious and colourful concoctions to add to your parties and celebrations. It’s all about sipping this month at The Recipe Redux and I can’t wait to check out all the healthy cocktails and mocktails from the other members. See the link at the bottom of this post for ideas to try! Directions: Add rhubarb and water to medium saucepan and heat over medium heat until rhubarb is soft and tender. Add honey, taste for sweetness and adjust if necessary. Let cool. Add oranges and cooled rhubarb to blender and process until smooth. Add 12 ice cubes and process until ice is slushy. Serve immediately. Each serving has approximately 65 calories, 12 grams of sugar. Sounds so delicious and refreshing! I love that you reinvented the slurpee so your kids could have a healthier alternative. What a great idea – will definitely pin this recipe for future hot summer days! Thanks so much! This sounds like a great alternative to the sugar-loaded drink. I am looking forward to trying it. It sounds delicious! I love the combination of orange and rhubarb and this would make a really refreshing drink on a hot day.